This Pyrex 10-piece set is on sale now for just $15! Pyrex makes a variety of food storage containers. Besides being healthier, these glass containers are easier to keep clean (you can put them anywhere in the dishwasher), they don't absorb food smells or colors, and they can go from the oven to the fridge to the microwave to the dishwasher. Easy! 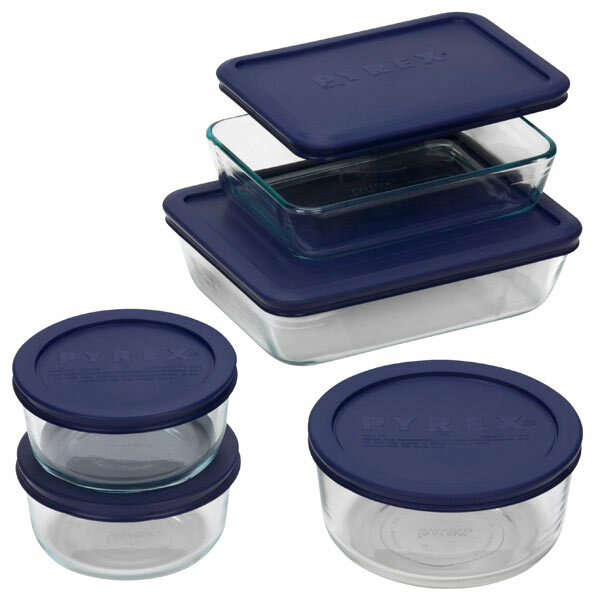 Pyrex Premium Glass Lids is the only storage product with an airtight and leak-proof glass lid! Their website boasts "a contemporary and sleek lid design that is 100% oven safe, and offers increased durability and greater food visibility than plastic lids." The one downside is they are a bit pricier: You can buy a set of three 2-cup containers on Amazon for $25. We just purchased a set of nine assorted Pyrex containers with supertight leak-proof plastic lids that are BPA-free. They were only $32 on Amazon. You can't put the lids in the oven, but that wasn't priority for me. Though made for home canning, mason jars are great for storing liquid leftovers like soup and sauces. The wide mouth jars are good for chunkier leftovers. Sadly, the standard lids have BPA in their lining. Ugh! There are reusable BPA-free plastic lids though. Ahhh! 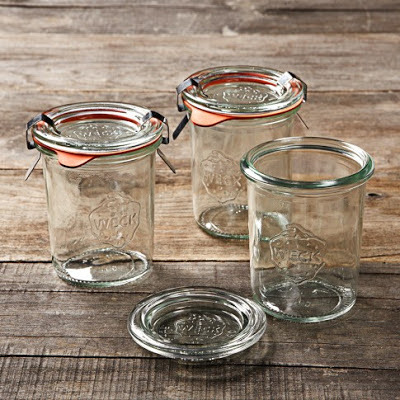 Green Depot sells Weck canning jars with glass lids (and rubber rings). So does Williams-Sonoma. These are 100% plastic-free. Hooray! Since you can't see through them, metal containers aren't ideal for storing leftovers in your fridge (unless you're willing to commit to labeling each container with a post it or painters tape). 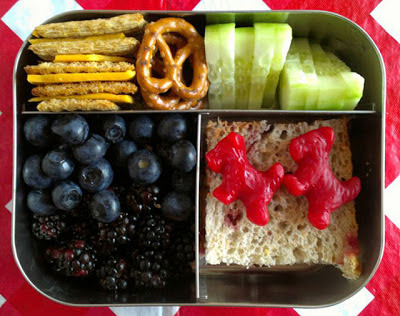 But metal food storage containers are just as easy to keep clean and fresh as glass, while being lighter and more durable than glass, making them the perfect containers for school lunches, trips, hikes, and other times you wanna brown bag it. 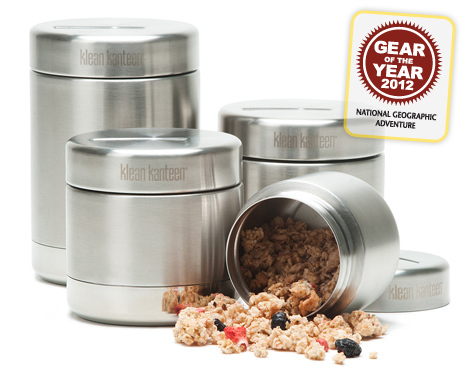 Klean Kanteen just announced they'll release a line of leakproof, 100% stainless steel food canisters this Spring. I love, love, love their water and coffee bottles, so I can't wait to try these new products! Extra excited that the line will include vacuum insulated canisters too! They were chosen by National Geographic to be part of the Gear of the Year 2012. Making them even more badass is the fact that they are designed to make shopping for bulk foods supereasy. They have space on the lids for you to label them with the bulk ID number using a grease pencil or marker. I'm guessing they've got the container weight printed on them too. Hooray for not having to take plastic bulk bags or remember to wash resusable ones! Klean Kanteen canisters are dishwasher safe! Woo Hoo! Lots of other companies already make stainless steel food containers. EcoLunchbox makes 100% stainless steel bento style boxes in several sizes. Lunchbots makes a variety of stainless steel containers, including several with different compartments and insulation. Olivia this is a very informative blog. I love it! Thanks so much! Superglad it's helpful to you! of the Man Purse), it's the last lunchbox you'll ever buy.